This homemade costume for families entered our 2014 Halloween Costume Contest. Picture taken 10/31/2014 - All three of our costumes are made out of cardboard boxes. The traffic light has working lights and the monster truck has working headlights, tail lights, and flood lights. The monster truck's wheels are made of Styrofoam and then covered in felt. We are the Morgan family - My husband & I are Jennifer & Mike, my son is Michael Morgan. He is 2 1/2 years old. My son is crazy about Monster trucks so, of course, he had to be a monster truck for Halloween. 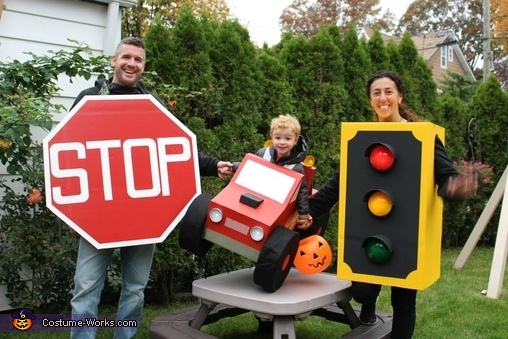 We decided to be the traffic signs to go along with his costume. Hi where did you get the headlight from?? And what size box did you used for your son costume..i doing this for a birthday party..